Popcorn is a complex carb and high in dietary fibre, which can contribute to a decreased risk of stroke, diabetes, heart disease, high blood pressure, high cholesterol and obesity. It’s also good for helping prevent haemorrhoids and constipation. Not bad for a dirt cheap snack that takes no time at all to prepare. 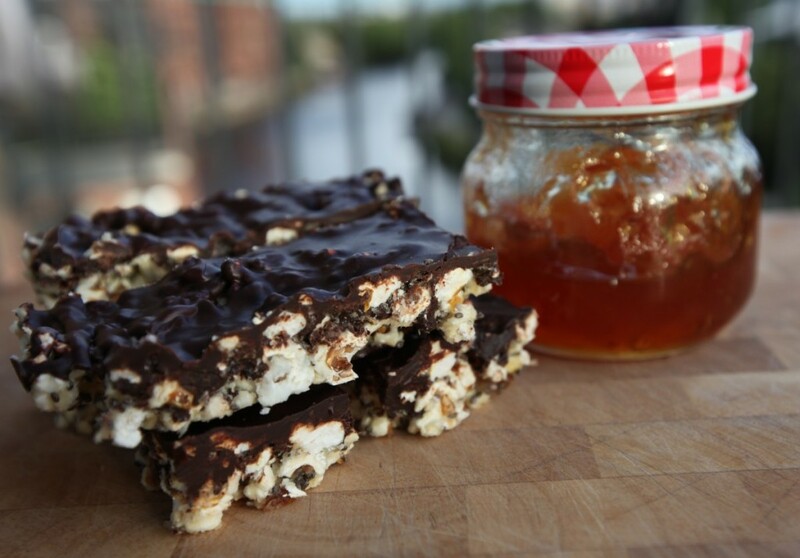 These Chocolate Orange Popcorn Energy Bars are absolutely delicious and – bonus! – quick and easy to make. They’re reminiscent of a certain popular chocolate orange snack much loved by triathletes for their quick energy release. These bars are much better for you though: they’re vegan with chia seeds for a protein boost and no artificial additives. What shall we call them – Chiaffa Cakes…? Very lightly grease and line a 9 inch x 9 inch (22cm x 22cm) baking tray. Melt the creamed coconut over a low heat on the stovetop or in a bowl in the microwave. Check it often - it burns very quickly and you don't want that. Place the melted creamed coconut in large bowl with the popcorn, chia seeds and marmalade. Mix together well (it's easiest to use your hands but you'll manage with a wooden spoon if you don't fancy getting sticky). Press firmly into the baking tray, then pop it in the fridge. Melt the chocolate in a bowl in the microwave or over a pan of simmering water. Pour the chocolate over the popcorn mix, spreading it all the way to the edges. Put the tray back in the fridge and leave to set for at least an hour. Cut with a hot knife to avoid cracking the chocolate. Hi, what would you suggest instead of coconut (I confess, I’m a true coconut hater) ? Ooh, I reckon any dairy free spread would work – let us know how you get on! What’s creamed coconut, is it coconut oil or coconut milk?